When the Winchester and Portsmouth D.G. held its first Dinner seven years ago, the Bishop of Portsmouth (Rt. Rev. 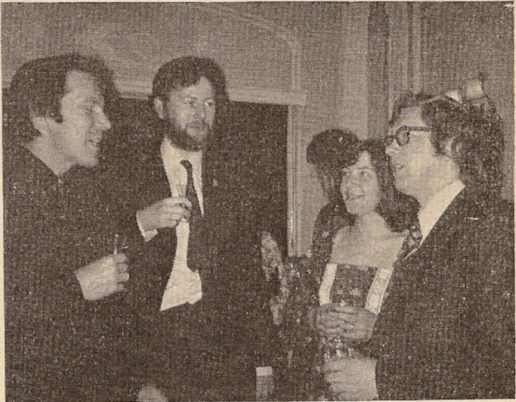 John H. Phillips) was present to give his support and encouragement to the organisers and to wish them well in their efforts. On May 3 at the Royal Hotel, Southampton, Dr. Phillips was present once more to preside over the proceedings (and a capacity attendance) of the seventh annual dinner, but this will be the final occasion in the office of President, for in July he retires and will become the incumbent at Lulworth, Dorset, in the Salisbury Diocese. The Master of the Guild, Mr. R. Roger Savory, welcomed the gathering and spoke of the Bishop's pending retirement, thanking him for his interest, help and support during the past years. He sent the good wishes of the members to Mrs. Phillips who was unable to attend the dinner, being indisposed following an operation. The President thanked Mr. Savory and said he felt a little sad having to leave the Diocese. He sometimes wanted to say thank you to the ringers for their services but thought it unnecessary as ringers enjoyed their work and gave themselves freely, doing all they could for the Church. The first toast to be honoured was that of "The Guild" and this was entrusted to the Master of the Ancient Society of College Youths, Mr. David E. House, who said that it appeared to him that the chief job of the Master of the College Youths was not running practices at important London churches, not chairing meetings, not arranging peals in fancy methods, but travelling around the country eating free dinners and making speeches. Having been a resident ringer during his earlier life, in Southampton, Mr. House was able, during his speech, to bring in many amusing events of a local nature, which delighted his hearers, and his references to the College Youths brought several comments from some of those present who belong to the Cumberlands. In serious vein, however, he complimented the W. & P. Guild officers on their leadership and said that there were those who had given excellent service for very many years, whilst there was also a wealth of talent among the younger generation. However, it was important how that talent was used. A number of Associations were in the region of 100 years old, and the main pattern of activities was the same now as it was then. The Master (Mr. Roger Savory) looks on whilst the Bishop of Portsmouth makes a point to Mrs. Madeline Croft and Mrs. Savory (r.) enjoys the joke. But the world has changed, continued the speaker: transport, communities, leisure, attitudes to the Church, science resources, etc., and there were now redundant churches, unringable bells, noisy bells, and so on. There were still centres of good ringing and opportunities for ringing four or five times a week if one wanted to do so. It was necessary for guilds to be alive, to be flexible, to take the initiative on restorations, sound control, in teaching, and to encourage new ideas. Above all, concluded Mr. House, do not be discouraged: there are ways round every problem. The W. & P. in the past had given its members and the Exercise good ringers, good performances and good fun, and may it long continue. The toast was enthusiastically received. The reply was given by one of the more senior members of the Guild, Mr. Frederick E. (Ted) Collins, who said he joined the Winchester Guild in 1919, had spent many years outside its territory, but, like the prodigal son, had returned and now enjoyed doing what he could to help the Guild. He complimented Mr. House on his elevated office in the College Youths [applause] - an office he himself had held in 1953. The Bell Restoration Fund for the Guild which had only been started within the past three years was the theme which Mr. Collins used in thanking Mr. House for his kindly speech. This Fund, he said, was something of which the Guild could justifiably be proud and which he, the speaker, had enjoyed assisting. Within 1 year and 10 months of its inception two grants had been made, and there remained £1,100 in the bank. Now two years and 10 months later there was a balance of £1,822 10p [applause]. However, there was no reason to be complacent. It was very necessary to continue to increase the funds, and by July this year there should be £2,000 in hand. "If anyone present feels disposed to give a donation towards the Restoration Fund, the treasurer here will be pleased to receive it," concluded Mr. Collins amidst applause. 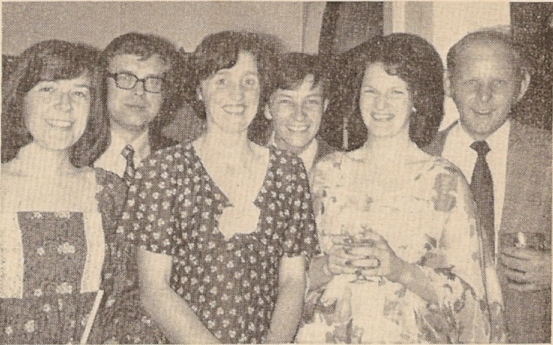 The Editor of the Ringing World, Charles Denyer, and Mrs. Edna Denyer, were also greeted by Mrs. Kippin, who pointed out that Charlie Denyer and she had been brought up in the same district. He came from a ringing family - his father being old Bill Denyer of Aldershot, and she likewise, her father being old Bill Melville of Guildford. She would not say how long she and Charlie had known each other and hoped he would be gentlemanly enough not to mention it either [laughter]. However, the first territorial association he joined was not the Guildford Guild but the Winchester Diocesan Guild. "Tonight he is here as Editor of the Ringing World", concluded Mrs. Kippin, "and to him and all the other visitors we extend a hearty welcome." The R.W. editor in reply extended the thanks of his fellow-visitors to the Master, his officers and the members of the Winchester and Portsmouth Guild, and congratulated them on their progress over the years. He referred to the old photograph of 50 years ago in the current issue of the Ringing World and said he had known most names and had rung with at least a dozen of them, he having joined the Winchester D.G. in 1923, Aldershot then being part of that Diocese. Several of the problems facing a R.W. Editor - particularly those on the lighter side were told, and an appeal to ensure that the journal's circulation kept going upwards was made. He suggested that the young people of today should be encouraged, for it would be their responsibility to see that the Exercise was carried on in the years ahead. "Their is little the youngsters do today that we haven't done in the past," concluded the speaker, who once again thanked the Guild members for their hospitality. Seated at the principal table were the Bishop of Portsmouth (Rt. Rev. 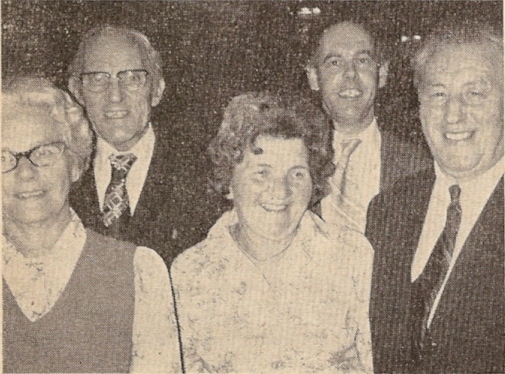 J. H. Phillips), Mr. Roger Savory (Guild Master) and Mrs. Savory, Mr. David House and Mrs. House, Canon Kenneth Felstead and Mrs. Felstead, Mr. Frederick E. Collins, Mr. Kenneth Croft (Treasurer) and Mrs. Croft, Mr. and Mrs. Charles Kippin, Mr. Barry Fry (secretary) and Mr. and Mrs. C. W. Denyer. Altogether between 150-160 attended the dinner. For the seven years that the Dinner has been held, the menu (main course) has never had to be repeated, we were told, and there is no doubt in our minds that next year's will be yet another variation. The meal and the whole of the organisation is always excellently carried out. The Rev. 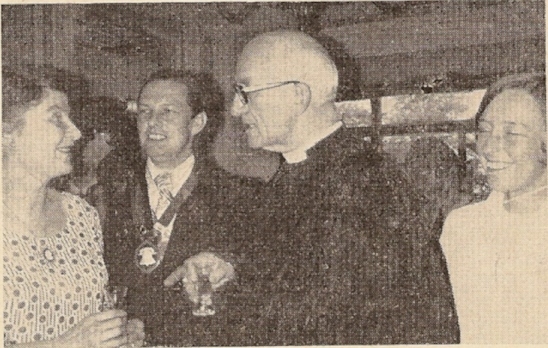 Harold Stringer (l.), priest-in-charge of St. Michael's, Southampton, in conversation with Mr. David House (r.), Master, A.S.C.Y., and the recently-appointed secretary of the W. & P. D.G. (Mr. Barry Fry) and Mrs. Janet House join in. A delightful trio of young ladies from Fawley (the Master's home village) entertained with songs and miming, and a well-struck course of Grandsire Caters was rung on handbells by 14-years-old Catherine Davis 1-2, William Perrins 3-4, Daniel Matkin 5-6, William Croft 7-8 and Roger Savory 9-10. "My Lord Bishop, Master, Ladies and Gentlemen - and you shut-up," exclaimed Mrs. Jessie Kippin amidst loud laughter when she pointed to a "supporter (?)" who endeavoured to give words of encouragement. "The Master has just asked me to say something whilst he fetches his young ladies (the three entertainers), but I'd prefer it the other way round," said the Bishop amidst laughter. The Guild's peal books were on display and Canon K. W. H. Felstead, whose peal records for the whole Exercise are well known and used, explained that many years ago, when he first examined the Winchester D.G. 's books, he found so many peals missing that he started cataloguing peals to ensure complete records. There are many additional pencilled entries in the books and Canon Felstead has since obtained and kept records for many of the peals in the whole Exercise, the Winchester Records (or lack of them) having started him on this job which he now does so well. Some years ago these three (male) ringers rang together many times when resident in the Southampton area. It was something of a happy reunion as the photograph shows at the Winchester and Portsmouth D.G. Dinner (l. to r.) Janet and David House, Heather and Chris Kippin, Margaret and Michael Thomas.